As we go to press it has been announced that 7 Indian executives have been found guilty of “criminal negligence” over the Bhopal gas leak which killed between 8 and 15,000 people, and left a further 500,000 suffering from its toxic effects in 1984. They will face a maximum of 2 years in gaol and a fine of £2,100. It is a reminder of just how little capitalism cares about the consequences of its actions in search for profit. The US Chief executive of Union Carbide at the time, Warren Anderson, remains free from prosecution in the US. Union Carbide gave a derisory $470 million in compensation against the $3.3 billions claimed by the Indian government. Today however environmental disaster due to the blind search for capitalist profit has come home to America. The Deepwater Horizon oil exploration rig exploded on 20 April killing eleven workers. The immediate loss of workers’ lives was in itself a major tragedy, yet the explosion was just the beginning of this disaster which has become a major environmental catastrophe with profound implications for the health and livelihoods of tens of thousands who live and work along the US coast of the Gulf of Mexico. More than six weeks after the initial blast, several attempts to cap the well have failed and there is now a real prospect (despite recent BP operations) that the oil will continue to spill out until August when a relief well can be sunk. This has now become the worst oil spill in US history. It will have devastating environmental consequences long after the leak is stopped (there is still oil on the beaches of Alaska from the 1989 Exxon Valdez spill). Drilling for oil in the sea is an inherently complex and risky business that should be subject to the highest safety standards and procedures available. But there is significant evidence to suggest that the Deepwater Horizon 'accident' came about as a result of procedures implemented by BP to save time and money. In other words this was a disaster arising from the desire to maximise profit, a disaster of capitalism. It has emerged that several days before the blast, BP chose to cap the well with a seal that was the riskier of two options, for reasons stated in a BP document to be the 'best economic case'. Further on the morning of the disaster BP let contractors leave the rig without conducting 'cement bond log' tests on the concrete. These tests are regarded by engineers as important for ensuring the integrity of the cement. Additionally there is evidence of time pressure, as BP had hoped to move the Deepwater Horizon to drill another well by early March but they were considerably behind schedule. This delay had already cost BP an estimated $21million. Every time the wind blows from the south-east to the shore, people are being made sick. It causes severe headaches, nausea, respiratory problems, burning eyes and sore throats. Long-term health effects can include neurological disorders and cancer. Experience from previous oil spills shows that the greatest risk is to the workers recruited for the clean up operation and this includes problems arising from exposure to the oil dispersal chemicals, as well as the crude itself. The crews of boats are obviously in contact with the spill for longer than anyone else but the situation is made worse here by BP. It is using a toxic oil dispersant called Corexit, to break up oil in the water. This is apparently the most lethal stuff available. According to The Los Angeles Times George Jackson, a 53-year-old fisherman from Louisiana lost his job because of the spill. He had no choice but to sign up with BP to assist in the deployment of containment booms in the Gulf. Jackson complained of burning eyes, headaches and nausea after spending hours working on the water. “They told us if we ran into oil, it wasn’t supposed to bother us,” Jackson told the Times, adding, “As far as gloves, no, we haven’t been wearing any gloves.” There are also allegations that BP has prevented its clean up workers from wearing respirators for fear of creating an atmosphere of panic, although failure to wear respirators is in breach of health and safety regulations for dealing with hazardous chemicals. However the Occupational Safety and Health Administration, an agency of the US Department of Labor, has given BP its support, and has insisted BP cleanup workers do not require respirators. BP’s boss, Hayward, whose name has become a by-word for arrogance throughout the disaster suggested that the health problems must be due to food poisoning! Try telling that to the crew of the 125 boats pulled back to the shore on 2 June because of the extent of their health problems. The scale and proximity of this disaster to the US mainland has ensured that it has received huge media attention. Yet it is by no means unique or even rare for these type of accidents to occur in the oil industry. Even as the Deepwater Horizon oil spews into the Gulf of Mexico, another pipeline owned by BP leaked 100,000 gallons in Alaska. The Alaska pipeline has a notorious history of poor maintenance and BP management's attempt to silence critics was even described by a US Federal Court judge as being 'reminiscent of Nazi Germany'. So far BP is reported to have spent about £1 billion in trying to clean up and contain the oil. This is peanuts compared to the size of its revenues. Its shareholders are due to get at least ten times that amount in dividend payments alone (coyly though BP has postponed announcing thus until the end of July). 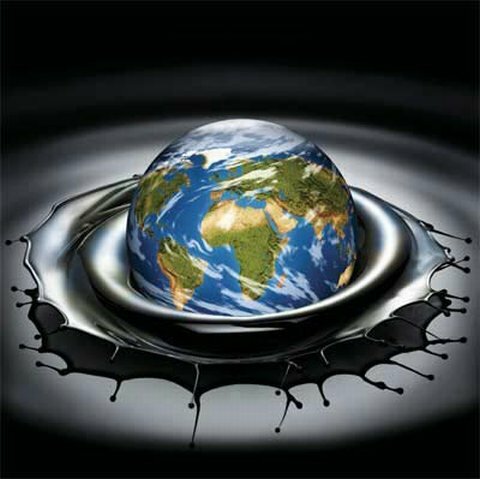 In what used to be called “Third World” countries the oil companies do not even attempt to clear up the spillage. As oil production is often the mainstay of the economy, governments are either unwilling or unable to force the oil producers to clear up the mess. It is not so very different even in the U.S. Despite Obama's populist criticism of BP (assisted by the fact that BP is not an American corporation) the government and the oil industry, as we saw above, operate hand in glove. The so called regulator, the Minerals Management Service (MMS) is well know for its cosy relationship with the oil companies, much the same as the Financial Services Agency's relationship with the banks. This relationship got even cosier under the successive Bush Administrations since the oil lobby had got their men (Bush and Cheney) into the White House. Obama’s gesture of a six month ban on new drilling around the US coast will certainly not be renewed once the political heat of the Deepwater Horizon disaster has dissipated. This is not least because the pollution off the coast of states like Mississippi and Louisiana has already destroyed the fishing and tourist sectors. Now all that is left is the oil industry and 6000 jobs are at risk in the state of Louisiana alone if the ban continues. On the Larry King Show Obama publicly admitted that he is over an oil barrel when he announced “We’ve got to have domestic oil production,” even if he qualified it by saying that this was as soon as a commission could establish it could be done safely. This is the second major disaster to afflict the Us coast on the Gulf of Mexico. In some ways it does compare with the aftermath of the natural disaster on Hurricane Katrina. There is the same cutting of corners to make greater profit, the same indifference to the fate of local people afterwards. It is the same culpability of the system. Preventable accidents occur in all industries, as capitalism regards workers lives as cheap. In most countries, particularly in the “Third World”, workers and their families are lucky to receive even paltry compensation for death or personal injury and often receive nothing at all. One of the most notorious industries for accidents is the coal mining industry in China. These are the most dangerous coal mines in the world in which 2631 workers were killed in 2009, an average of 7 per day. The recent accident at the Wangjailing mine in northern China which trapped 153 workers in underground, occurred after repeated reports of water coming into the mine were ignored by management. This is just one more example of capitalism's disregard for the lives of workers. To the discomfit of the capitalist press the debacle in the Deep South has vividly demonstrated that capitalism itself is responsible for the greatest part of the death, destruction and social breakdown that has accompanied this ‘natural’ disaster. The richest state in the world, the self-styled defender of democracy and human rights, could not reveal more clearly how its defence of profit and private property does not square with the defence of the majority of its citizens for whom it has a callous indifference. Katrina and its horrendous aftermath have laid bare the myth that the unseen hand of the capitalist market results in a rational form of social organisation. Nothing is further from the truth. The chilling fact is that more and worse ‘natural’ disasters lie ahead. The idea that rampant, crisis-torn global capitalism can be reformed into a benign, socially responsible, environmentally ‘friendly’ system is a utopian dream. The best thing that could come out of the disaster of Hurricane Katrina is the recognition by at least some of those who are looking for a better world that capitalism is unsustainable and has to be overthrown. There is only one alternative: the organisation of a global community organised to produce directly for society’s needs. Once again, capitalism is forcing the issue. Socialism or barbarism. There is no third road.